Custom metal LED flashlight possesses aluminum metal body and it is powered with high intensity LED flashlight. This flashlight is offered in grey, blue, red and black hues. Advertisers working in constrained budget can always rely on this flashlight to get their word out. 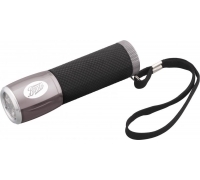 It becomes easier to carry this flashlight around due to the woven strap attached to its tip.